IDAHO FALLS, Idaho – The solar eclipse is drawing people from around the world to eastern Idaho. Because of this increase in visitors to the region, the Bureau of Land Management advises a high level of caution when discharging firearms in areas affected by the solar eclipse. Many eclipse spectators will be camping and recreating on public lands while viewing the event. Visitors may be unfamiliar with the terrain, public land usage or local laws and customs. If you plan to target shoot, check your sights first, keeping an eye out for skywatchers and other visitors enjoying Idaho’s public lands. The BLM is also concerned about human-caused wildfires due to an influx of people and hot, dry conditions. A popular target shooting area, Menan Butte is expected to receive heavy eclipse traffic. The Menan Butte area has already experienced several wildfires caused by target shooting this year. ● Choose a shooting area that is clear of dry grass, vegetation and rocks. ● Discharging a firearm using incendiary, steel core or tracer ammunition is prohibited on BLM lands from May 10 to Oct. 20. 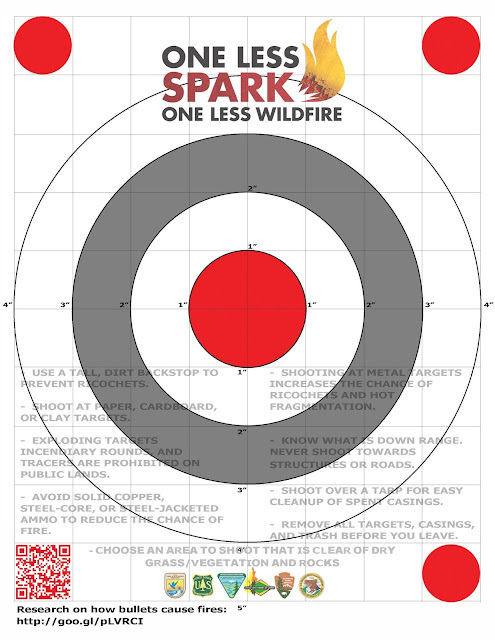 ● Burning, igniting or causing explosive material to burn, including exploding targets is prohibited on BLM lands from May 10 to Oct. 20. ● Always bring water, a fire extinguisher and a shovel. For breaking fire information, follow @BLMIdahoFire on Twitter and search for #BLMIFDFire for posts specifically related to eastern Idaho. For additional wildfire updates, Firewise information, and fire prevention tips visit www.IdahoFireInfo.com. While enjoying your BLM public lands please be aware of your surroundings. One less spark means one less Idaho wildfire.